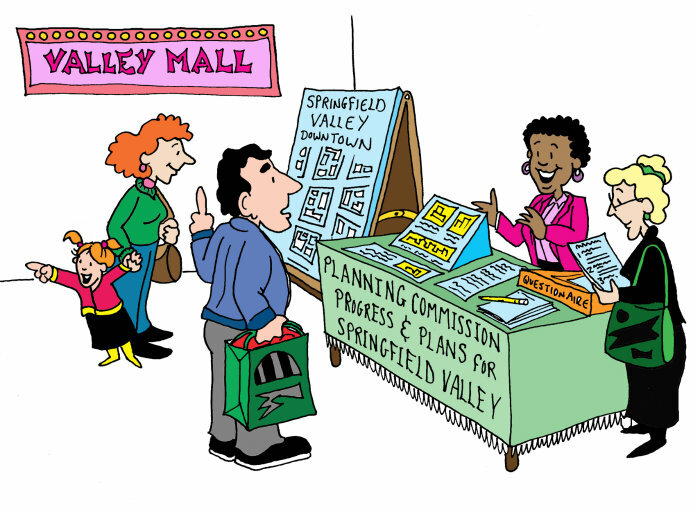 If there were one thing that would most improve the effectiveness of your community' planning commission, what would that be? 1. Education / Training. By far the most frequently mentioned suggestion was to have more education and training programs for planning commissioners. Some 53 of the 215 suggestions we received -- 25 percent -- related to this. 2. Public Participation. The second most often mentioned idea, listed in 24 replies, was to have greater public participation. 3. Appointment Process. Fourteen people noted the need for a better appointment process for commissioner. 4. Meeting Etiquette & Attitudes. We classified 11 replies under what we'd call better meeting etiquette, such as being respectful, not missing meetings, and coming to meetings well-prepared. Several of the comments paralleled those dealing with the appointment of new members -- as we'll discuss later in this post. 5. Proactive / Long-Range Focus. There were also 11 comments that mentioned the need for the planning commission to have a long-range focus, and not just act in a reactive manner. As with all of our open-ended questions, there were a number of comments that did not fall within the larger groupings mentioned above. Smaller clusters of comments involved planning commission relations with staff and with the governing body, and the importance of adhering to the comprehensive plan. We'll expand on this in the last section of this post. Twenty-five percent of our respondents named increased education and training programs as the one thing that would most improve the effectiveness of their community' planning commission. 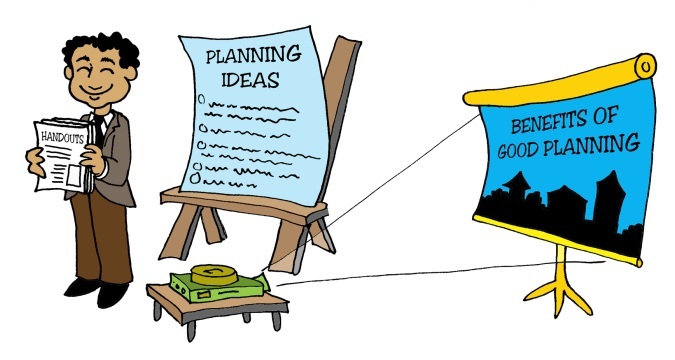 Training on how to run a good meeting, and education in planning concepts and trends. A California respondent who has served as a planner and planning commissioner recommended: "Specific and regular training on basic 'urban planning principles,' on parliamentary procedure, and on quasi-judicial 'findings of fact' process," while a planner from New Mexico called for "Training on how to run a good meeting, and education in planning concepts and trends." From a Virginia planner: "Would love for there to be a requirement for Planning Commissioner training within a certain length of time from appointment to the Commission." A planner from Alaska wrote of the need for: "Training, training, and more training. … Between understanding how to function at a public meeting, how to function as a citizen planning commissioner in Alaska, and what the workload for the planning staff is when an action is taken by an applicant or the commission I find that the commissioners really just need some training and/or resources to work with so that they may better weigh-out sensitive issues. This is especially true, being in such a small town. …"
Plan commissioners value information, education and networking with other plan commissioners. There was also this comment from a Wisconsin university extension educator who facilitates a "County Plan Commissioner Network" that meets quarterly: Plan commissioners value information, education and networking with other plan commissioners to help them be more effective and feel more confident in their work as a commissioner. Plan Commissioner orientation, ongoing education, and the opportunity to learn from each other are important." The second most often mentioned suggestion, cited by 24 respondents (11 percent), was to have increased or better public participation. "Give better notice of meetings." "More public participation/attendance at meetings." "All around, better communications with the public." "Find ways to get board members out in the community talking about and promoting planning ideas and getting feedback on those ideas." Fourteen of the 215 respondents (7 percent) noted some aspect the commissioner appointment process as the most important way to improve a commission's effectiveness. Several of these comments noted the need for greater diversity on the commission. Appointments that reflect wider viewpoints and perspectives in the community. "Appointments that reflect wider viewpoints and perspectives in the community." "Increased diversity of commissioners (women, Hispanic). We have two developers, one realtor, and one appraiser on our [seven member] commission. Too many are in the building/realty/development business." "More young people and greater professional diversity. Typically dominated by real estate interests." "Better vet volunteer applicants to insure they can be good listeners and have the diplomatic skills to deal with all kinds of people and responses." We classified 11 replies under what we called "meeting etiquette and attitudes," such as being respectful, not missing meetings, and coming to meetings well-prepared. Several of the comments paralleled those dealing with the appointment of new commissioners. "Be respectful with staff and developers and change the tone at meetings." "Leave personal agendas at home. Always." "One member arrives late frequently. Curbing this would be less disruptive." "Need to try harder to be objective." 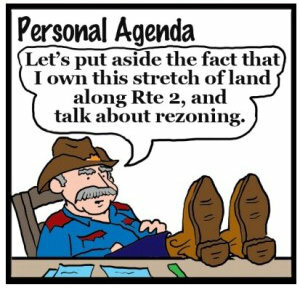 "Planning commissioners motivated to be better prepared for each meeting (read staff memos prior to meeting) …"
"The Chair has been the Chair for over 25 years. New ideas and new blood would greatly improve the Commission." Another 11 respondents mentioned as the most important way to improve their commission's effectiveness the need to have a broader, long-range focus, and not just act in a reactive manner. Keep focus on bigger issues facing the community ... try not to get bogged down in less consequential details or rabbit holes. "Take the time to talk about planning concepts -- what do we seek for the future?" "Do more real long-range planning instead of being reactive." "Keep focus on bigger issues facing the community … try not to get bogged down in less consequential details or rabbit holes." "There could be a second meeting each month, more like a workshop for progressive planning as opposed to reviewing applications." "Try to be more proactive on issues that guide the city, show a little leadership." 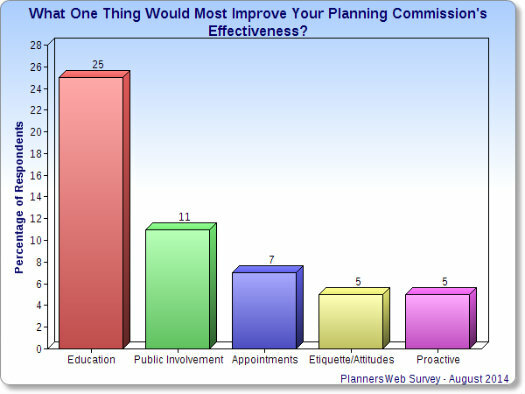 Nine respondents mentioned better or different commission-staff relations as the one thing that would most improve the effectiveness of their planning commission. "A staff that was more responsive to the Commission. Sometimes it feels like the commission works for the staff instead of the other way around." "Staff supporting rather than dictating to Planning Commission." "The former staff made us feel honored and valued. This staff is derisive, doesn't attend meetings (except the director, who insists that we agree with him)." "Closer working relationship between an effective chair and staff." "More support for long-range planning by the governing body." "Give [the planning commission] more responsibility; respect their recommendations." "Not to have commission decisions be over-ridden by the governing body." Note: our previous post summarizes responses to a question we asked respondents that more directly focuses on the relationship between commissions and governing bodies. Three comments mentioned the need for the commission to adhere to the comprehensive plan, such as this comment from a Missouri planner: "Better coordination of Commission decisions with the adopted Comprehensive Plan." We did have three respondents specifically note in their replies that nothing was needed to improve their planning commission's effectiveness. As a respondent from Oregon wrote, "They are already an effective, fair, and just body." An attorney at the meetings to "referee." But in contrast with these happy campers, one respondent suggested they needed "an attorney at the meetings to 'referee'," while another felt the best way to improve their commission's effectiveness would be to "replace all the board members and start over with a new group." We hope very few of you feel you're in that situation. This concludes our postings related to our August 2014 questionnaire.